Quite by chance we came across a painting on the internet of a cottage in Preston Capes which was painted by a painter living in Alabama. 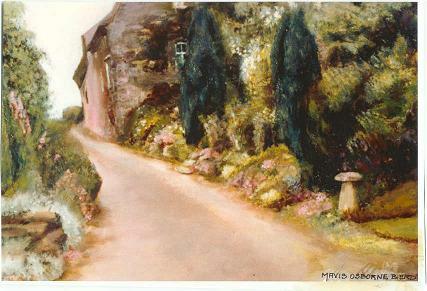 We contacted Mavis and she has kindly given permission for a copy of her painting entitled Uncle Harry’s Village Walk to be shown on the site. It turned out that Mavis’s Uncle Harry was Harry Butter who lived in Shorn Cottage. His daughter Christine Farmer and her family still live there. Harry Butter was my Uncle, He lived with his daughter Christine and her husband Gordon Farmer, they have a lovely old cottage right there in Preston Capes. Uncle Harry was married to my father’s sister, named Beautrice Osborne, she was also my godmother, they were very talented people. My aunty could sing like an angel and sang “Madame Butterfly” beautifully. Harry liked to walk about the village, and particularly liked the tiny lane up past this beautiful thatched cottage. Evidently Mavis used to visit Preston Capes a lot and also loved this walk.